Tonight at dinner you might not think about poverty, hunger, and poor nutrition, but unfortunately that’s not the case for one in nine people in the world. About 815 million people are going to bed hungry. It makes sense that one of the greatest challenges we are facing today is how to ensure global Food Security and achieve Zero Hunger, one of the UN’s Sustainable Developments Goals (SDG 2). Investing in smallholders is key to address food security, among them are many of the rural poor, vulnerable to risks. In the project “Improving Agricultural Risk Management in Sub-Saharan Africa: Remote Sensing for Index Insurance” we investigated ways to improve agricultural insurance for smallholder farmers by using remote sensing. Smallholder farmers currently produce 70 per cent of Africa’s food supply and 80 per cent of the food consumed in Africa and Asia. However, smallholders are vulnerable to a range of individual and widespread risks. Climate-related production risks trap households in poverty and food insecurity. Without tools to manage these risks, rural and agricultural development is hindered. Agricultural insurance schemes can play an important role as part of an holistic approach to rural development, by both protecting investments in smallholder farming as well as encouraging them. Index insurance – a type of agricultural insurance - is based on yield loss data, instead of individual, on-farm insurer visits. This makes agricultural insurance more accessible to smallholders. The standardized nature of the product also means it can be packaged with other services, such as credit or seeds, to form a comprehensive agricultural risk management and rural development strategy. IFAD, the International Fund for Agricultural Development of the United Nations, has been improving access of poor rural people to finance for over forty years. As part of this, since 2008, IFAD has been specializing in agricultural insurance. Index insurance is usually designed and operated using on-the-ground data, namely historical and contemporary weather and yield data. However, one of the main challenges to develop robust index insurance products is availability, accessibility, quantity and quality of these ground data sets. The project was designed to contribute to scalable and sustainable approaches to index insurance. More specifically, it assessed if and how remote sensing could be used for index insurance to benefit smallholder farmers. To overcome the above mentioned limitations of ground-based data, index insurance developers are turning to remote sensing approaches making use of the objective measurements and spatial coverage of EO data. However, despite the significant experience developed in drought insurance, applications for smallholders’ cropping activities are relatively new, and remote sensing data is not yet being used to its full potential for index insurance. What are the remote sensing methodology options and their possible combinations? Which remotely sensed data is best suited for which crops? How can the solutions be used operationally in index insurance? Example of how remote sensing was used in Senegal for index based insurance. 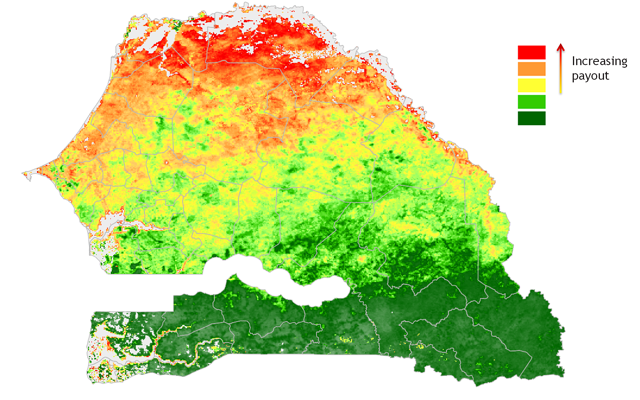 Detailed information on the results can be found can be found in Remote sensing for index insurance: findings and lessons learned for smallholder agriculture and in an accompanying overview. Additional research and development activities be supported to further improve the potential of remote sensing for index insurance. Further investment be made in ground data collection protocols, capacity, and systems. Different remote sensing approaches, dedicated mapping tools, and ground level sources of data and information be combined to improve the quality of index insurance structures. Schemes based on remotely sensed data be carefully planned for measures aimed at mitigating the occurrence of basis risk events (the potential mismatch between the payout and the losses incurred). Capacity be built of private and public remote sensing institutions in order to fill gaps in currently available expertise and ensure future sustainability. IFAD is now working on further scaling-up index insurance and will draw on the knowledge generated in the project thanks to its partners - including VITO - who have helped us better understand the potential uses of remote sensing for agricultural development. The project was implemented by the Weather Risk Management Facility (WRMF) of the International Fund for Agricultural Development (IFAD) and the World Food Programme (WFP) with financial support from the Agence Française de Développement and an additional contribution from the Belgian Federal Science Policy Office. 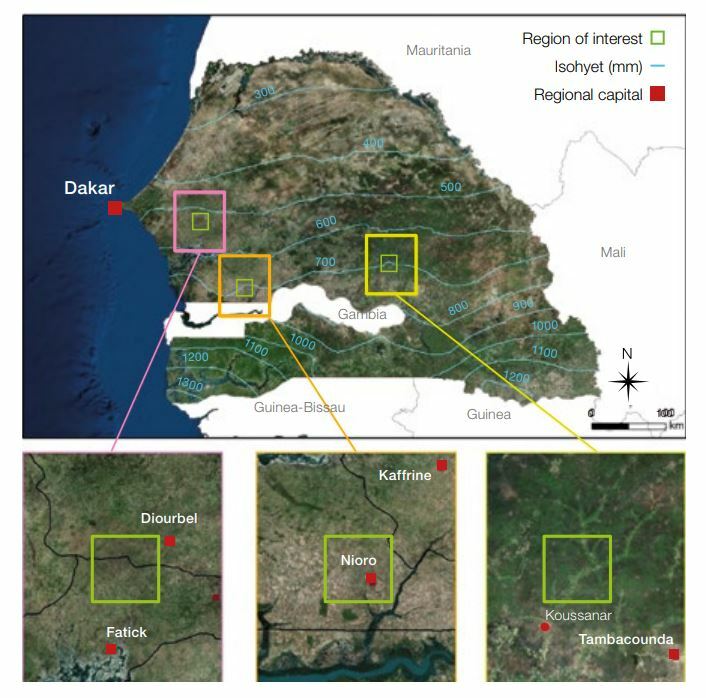 Although research and development focused on Senegal, the findings are intended to inform the entire sector.